The Active Mobility Centre are able to offer a range of varied wheelchair and scooter ramps, with differing features. This particular item is our standard wheelchair ramp with double handrail. It's solid and secure yet easily transportable. As with many of our ramps, this item is made predominantly from fibreglass meaning it is relatively easy to pick up and relocate where needed. Its two permanently fixed handrails (that double as carrying handles when ramp is collapsed), provide support and reassurance to those who need it. 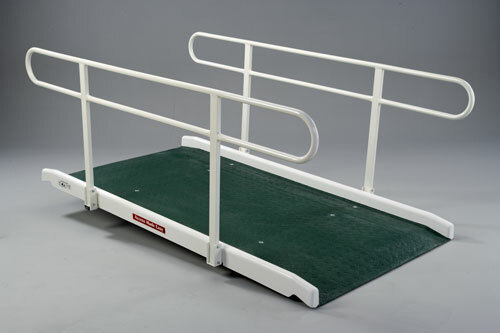 Easy to position and use, this ramp and available in a wide range of sizes.